Paul asked us to identify the location. Information about the tram would be interesting but is it outside an LNWR Station ? The markings on the wall on the right hand side suggest it is, if so which one ? For those knowledgeable in such matters, how could the tram have ended up on it's side ? Not much to go on but this looks like a narrow gauge ,3'6' ?, tram probably Birmingham.Also the police helmets look like Birmingham Police. Difficult to identify the livery but could be Birmingham's cream and black. I've no idea where the station could be. A copy of this picture is currently being sold on Ebay where it is described as "Tram Crash in Holloway, London". It is clearly a copy print but presumably the location must have come from the original? Perhaps the location is near the North London line. Having a closer look at the print on Ebay the clue is in the lower right corner where it states Holloway Handsworth which suggests Mike Barrett is right. I think Holloway has misled the Ebay seller (me to!). The narrow gauge of the tram tracks certainly indicates Birmingham, and there was a professional photographer named Holloway in Handsworth. The date of the photo seems to be during or just after WW1. There was a similar tram derailment in 1907, but this wasn't it. 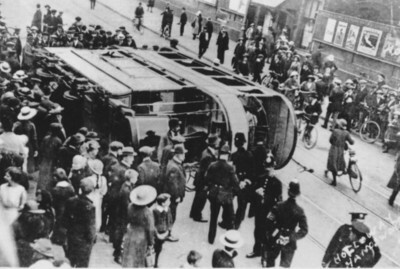 This shows the accident involving a South Staffordshire Tramways car from Darlaston to Colmore Row (Birmingham) which became derailed near Soho Road station in Handsworth and toppled over. Mr A Machin the stationmaster at Soho Road was concerned that it had hit the bridge abutment and instructed the signal box to halt traffic and then with the aid of a soldier assisted the passengers who had been hurt. Fortunately there were no fatalities. Mr Holloway the local photographer had a shop nearby and also assisted with the rescue. The driver of the tramcar Thomas Norwood aged 29 of Darlaston sustained a broken wrist whilst his lady conductor, Florrie Palmer also of Darlaston injured her ankle. Not surprisingly most of the injured were travelling on the upper deck. The accident took place on the morning of Monday 26th June 1916. Presumably Mr Holloway stood on the northern abutment of the railway overbridge to take his photograph and the view is looking in the direction of Birmingham with the station entrance on the opposite side of the road. The tramcar in the background presumably heading out of 'town', this of course being Soho Road. I wonder if A Machin is Arthur Machin born 7th September 1880 and who joined the L&NWR on the 1st October 1896 and was employed as a porter at Bescot, then a train recorder at Bridgeman Place in Walsall but was later Station Master at Tile Hill and at Witton.